We can build you: a high tech snowboarding kit! 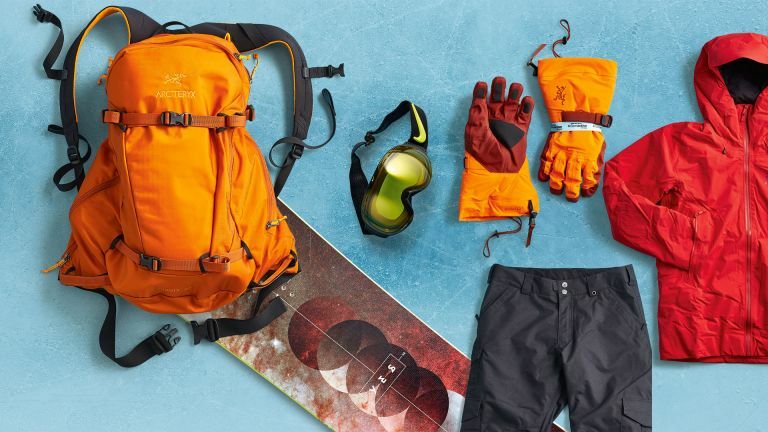 The Quintic 27 is designed for day-long backcountry, ski and snowboarding trips. Made from high-tenacity nylon,it's suitably rugged. A teardrop design keeps you well balanced regardlessof pack weight. As well as goggle- and hydration-compatible pockets, large side zips enable easy access to sizeable 'Wingman' pockets without you having to take the pack off. External padding protects your kit when you eat snow. The new, game-changing Yes 20/20 board is designed for bombing through the deep white stuff, catching air as you go. The standard swallow-tail design has been totally rethought, with a pronounced, deep concave addedon both ends, meaning the 20/20 always wants to be nose-up and tail-down– making it a genuine twin-powerboard. Riding it feels light and joyful. Offering complete UV protection, Nike's ace new Command Goggles are designed with Transitions Lenses. As well as sporting anti-fog treatment and frameless technology, the lenses have a self-adjusting tint, which means they automatically darken in sunlight and fade back on darker days. The six-base injected-polycarbonate spherical lens enables a wide field of view, too. Made from N333p-X 3L hydrophobic Gore-Tex with fully taped seams, these frigid-digit combatants are designed for skiing and boarding. Well insulated with PrimaLoft thermal insulation, they're rugged and durable, with top-of-the-range grip and dexterity (a big ask with this much insulation). So you'll be able to flick the Vs at your mates at -10˚C. This may cost close to £700, but it'll make you feel like a million dollars. Breathable N70p 3L Gore-Tex, plus tricot technology, keeps the wet stuff and the wind out. Inside, 750-fill power goose down and panels of Coreloft synthetic insulation (in areas where moisturemay occur) keep you warm, usingDown Composite Mapping to improve efficiency. The insulated helmet-compatible hood offers protection and warmth without hindering visibility. Made from tough, two-layertwill, with breathable mesh linings made from 100 per cent polyester, this leg armour offers surefire waterproof and breathable protection that looks as good as it feels. The 'sig fit' means the trousers should be neither too baggynor too tight. Bellowed cargo pockets are big enough to stick all sorts in.